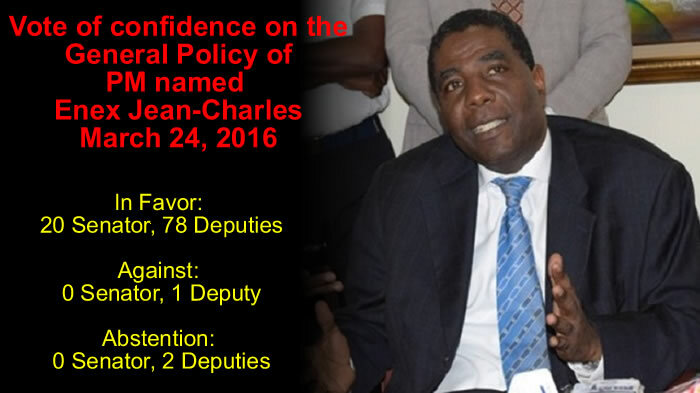 Enex Jean-Charles and 15 cabinet members sworn in on March 28, 2016. Among the people present were former Prime Minister Evans Paul who was very critical of President Jocelerme Privert. Installation of the new Prime Minister was completed following the confirmation of Haitian parliament and the new nine-member Provisional Electoral Council (CEP) has been established for organizing the second round of presidential elections, remaining parliamentary elections, and local elections to complete the electoral process begun in 2015. On March 28, 2016, the former Prime Minister Evans Paul has transferred his power to the new Prime Minister Enex Jean-Charles at the National Palace in the presence of the Interim President Jocelerme Privert. On the same day, the new Prime Minister and 15 cabinet members have sworn in as part of the country's interim government. 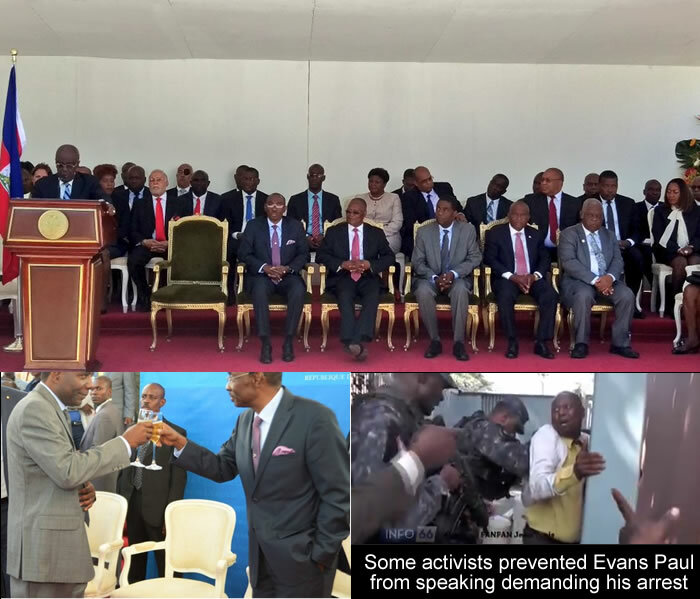 Some activists, who were present at the ceremony of the transfer of power between the two Prime Ministers, showed their dissatisfaction with the former Prime Minister Evans Paul, and interrupted his message delivered for the occasion. 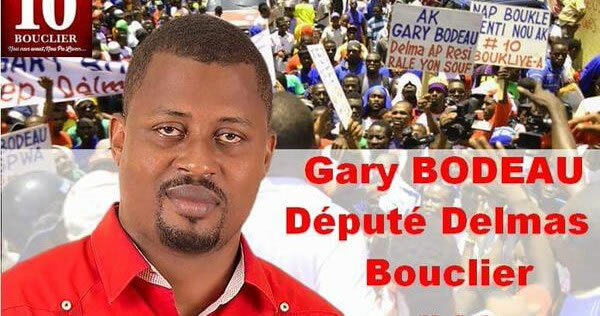 In just a few weeks in his position, the new Government Commissioner Danton Léger is creating problem for some members of the Martelly government. Here is a picture of former Prime Mkinister Evans Paul after he and his ministers have been prohibited from entering the Prime Minister residence in Bourdon. 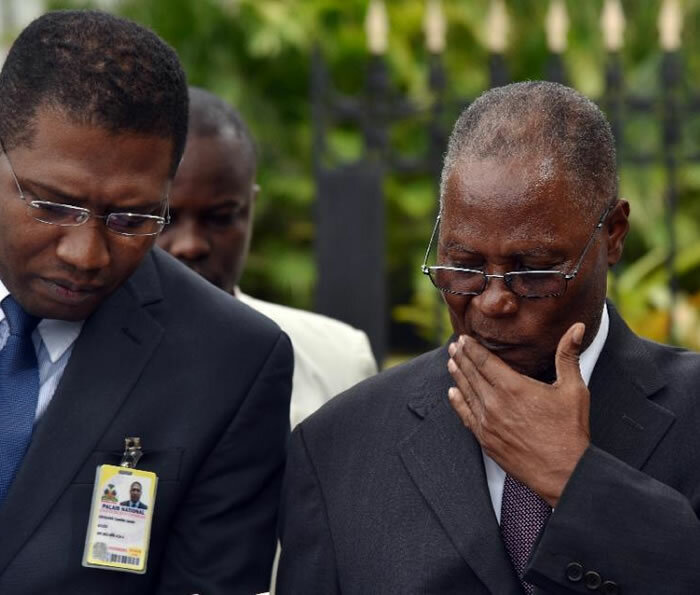 Now Haiti has two Prime Ministers. One is Fritz Jean, nominated by the interim president Jocelerme Privert and the other is former Prime Minister Evans Paul who has not yet submitted his resignation. 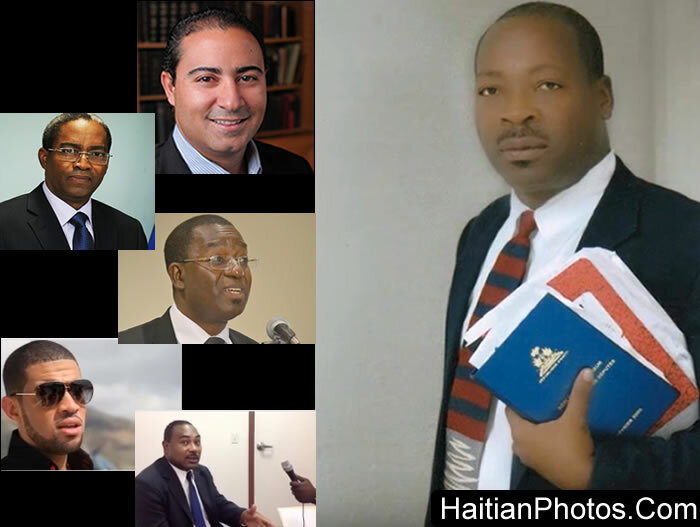 The new Haitian Prime Minister Nominee Fritz Jean has submitted his document to the 7-member parliament committee for verification and justification of his candidature in anticipation of securing the vote of confidence. 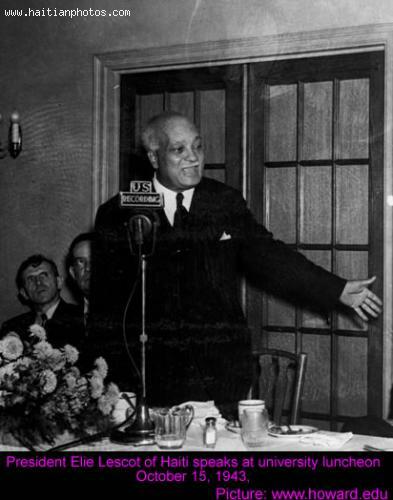 However, unlike interim President Privert, Evans Paul considers the appointment of Jean as Prime Minister is unconstitutional. 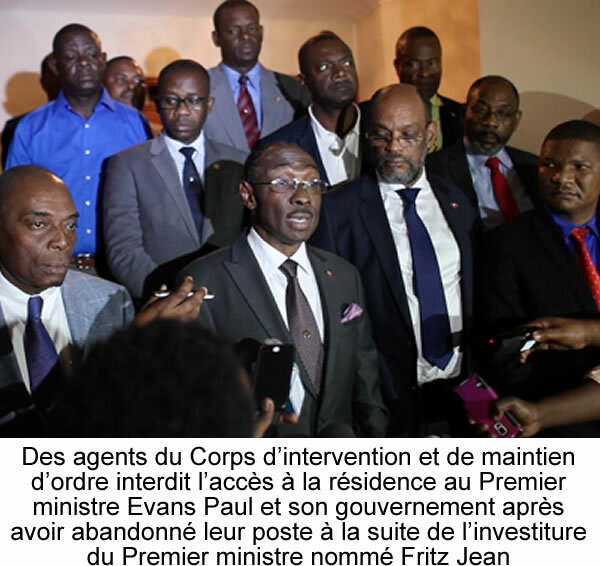 Mr. Privert in order to maintain the safety and security of all public building has prohibited the entry of Evans Paul to the official residence of the Prime Ministers in Bourdon, because Paul has publicly announced his withdrawal from the government. 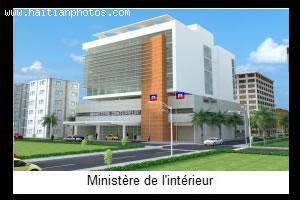 Here is a picture of the plan for the reconstruction of Haiti Ministry of Interior. The cost of construction of the Ministry is estimated at $ 17.5 million with funding provided by PetroCaribe-Treasury. It is estimated to create more than 150 jobs. Work for this building is underway and scheduled to be done by January 2014. On Thursday, February 4, 2016, President Martelly inaugurated the new building for the Ministry of Interior and Territorial Communities (MICT) located at the corner of Paul VI and Monseigneur Guilloux, on the site of the General Tax Directorate (DGI) which was destroyed in the 2010 earthquake. The five-storey building, with the financial support of the Treasury and the PetroCaribe funds, will house the MICT office, a meeting room, an infirmary, a cafeteria and a parking space for 120 vehicles at the ground level and for about thirty vehicles in the basement. The building will be equipped with three lifts and two emergency staircases-- everything meeting the norms of modern standard practices. Two construction companies, Constructora ROFI" (Dominican) and "Overseas Engineering & Construction Company" (Taiwan), were employed for the construction of the new MICT building. 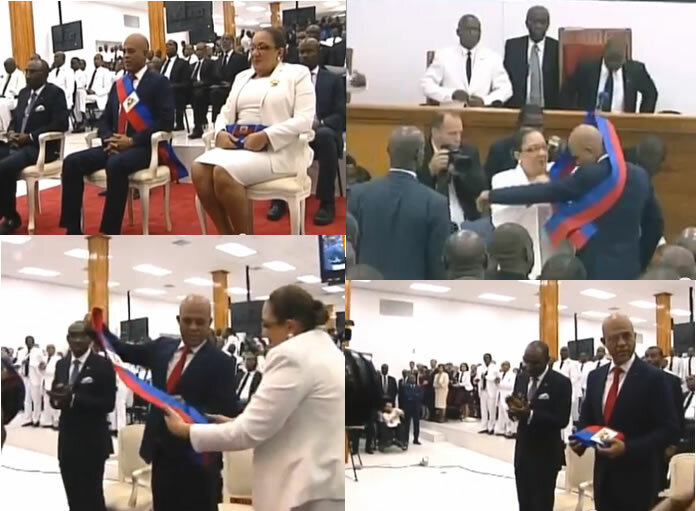 Here is a picture of the ceremony for the removal of presidential sash from President Michel Martelly. On Sunday, February 7, 2016, Michel Martelly made his farewell speech to the nation as he left his office without any replacement. His day of departure coincidentally became the first day of Port-au-Prince's annual three-day Carnival celebration, which was called off as violent protests erupted in many places. It was as well as the 30th anniversary of the fall of the Duvalier dictatorship. Martelly left the country in the hands of a disputed interim government amid one of the worst political crises in recent years-- and without a president. 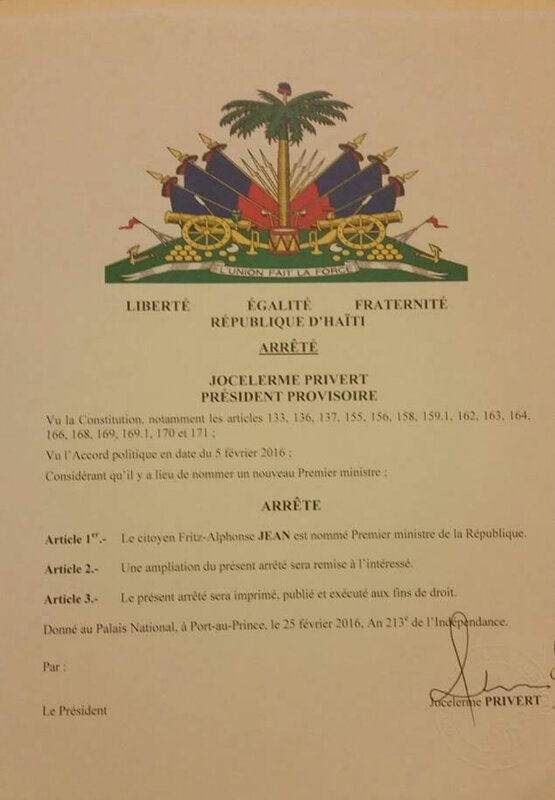 However, an agreement for a transitional government was reached just twenty two hours before Martelly left his office. To symbolize his departure, Martelly returned the presidential sash to the National Assembly by handing it over to the then National Assembly President Jocelerme Privert.